Maranta is a very clean skin that is easy to use and recolors beautifully. 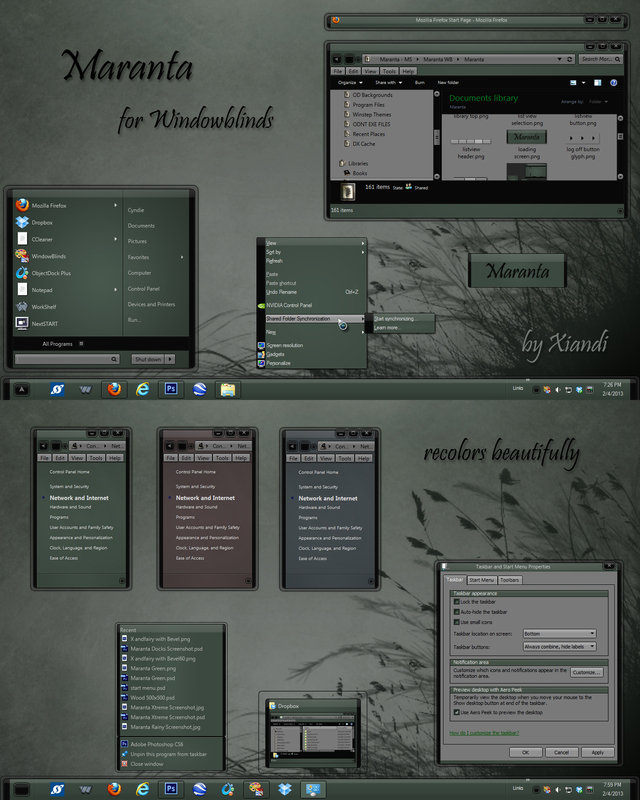 There are substyles for the top taskbar position and substyles with white explorer backgrounds for those that have programs that do not work well with grey backgrounds. I hope you like it as much as I do! Damn I hate drooling like this! Superb work Cyndie! Looking very nice, very nice indeed Xiandi. Surprise me why dontcha! Nice!! This is one of your best ever, Cyn!! I love it! Can't seem to take it off my screen. This is Soooo Beautiful! Sure hope there will be a Winstep to go with it?? There is. And she made docks and a rainy. You know what would be nice is that someone would pull all the themed skins to together in one place, like a suite and......oh never mind. This is just beautiful,is the background available? Will be soon. She dun good. Matching skins are up now! Stunning work ladyX, just stunnning! Thaks so much everyone! I'm really glad you like it! Yet another beautiful, well designed skin. My heartiest congrats to you Cyndie!